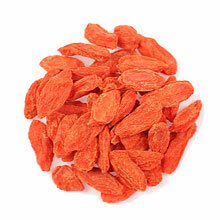 Dried wolfberry (also known as "Gou Qi" in Chinese) is a fruit that has many usages in China. It is used in cooking, added to Chinese tonic soups, in cereals, and even for plain consumption. These berries can also be boiled as herbal tea, or blended with other teas (most often with Chrysanthemum). Dried wolfberry looks like small raisins but is red in color. It is rich in vitamin A, anti-oxidant and is said to have many medicinal properties which benefit our vision, liver and kidney. Our Wolfberry is from Ning Xia Province, renowned for producing the best grade in China. Wolfberry from Ning Xia is juicier, more nutritious and has a unique fragrance. Wolfberry has natural raisin-like light sweetness. We recommend blending this tea with Chrysanthemum or other light teas such as Green and White teas. Dried, small red fruit. The infusion is light yellowish orange in color.